As Valentine’s day approaches, we stop to reflect on Kinnek’s role as Industrial Hitch, helping buyers find the suppliers of their dreams. Being matchmaker gives us a rare view into the elusive and mysterious SMB courtship process. We’ll examine part of that process here: messages sent on Kinnek for requests quoted by suppliers. We looked at all the quotes suppliers gave for requests on Kinnek from early '14-15. 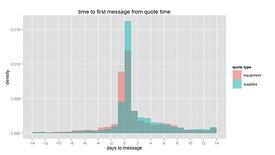 Over a third of individual quotes had messages between the buyer and supplier relating to the buyer's request. Now, it's important to note that the following analysis only looks at a portion of the conversation that takes place between a buyer and supplier. 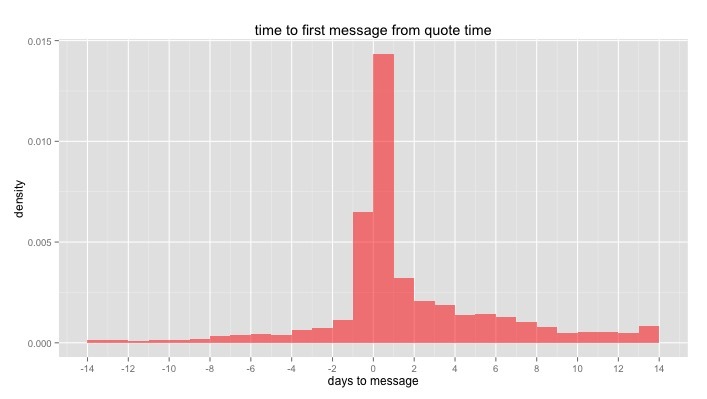 Outside of messaging, we can see when a supplier is interested enough to view the buyer’s phone number - over 25% of the time for quotes where no Kinnek message(s) even exist. Beyond that however, a buyer and supplier could be up all night talking on the phone for all we know! And while we want to avoid being the SMB Elaine Miller, understanding these interactions can help us here at Kinnek when it comes to being more effective matchmakers in the future. It’s not surprising that messaging occurs even before a quote reaches the buyer. Suppliers often need more details (i.e. to understand the context of the quote) in order to ensure they're estimating based on exactly what the buyer wants. As a result, it's safe to assume the first message sent before a quote is given comes from the supplier, not the buyer. 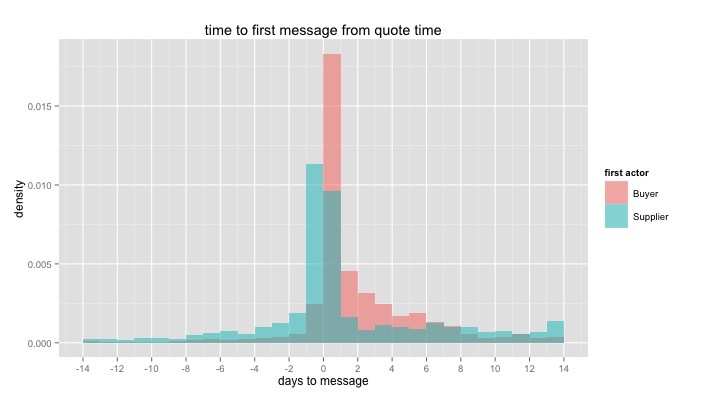 If we split the density by the first to message (as exhibited in the graph on the left), that becomes apparent - suppliers are indeed the first ones to initiate messaging before a quote is even given. Nevertheless, it should be noted that overall, buyers send the first message roughly 53% of the time. It's almost tied! Requests for equipment - as opposed to supplies - also tend to push suppliers to message first because equipment is more customized. That's what we see in the graph pictured on the right, with messages relating to quotes for supplies tending to be more concentrated post-quote than those around equipment. So exactly how long does the romancing last? The distribution of time between the first message and the last one is plotted (in days) on the graph pictured on the left. The bulk of these buyer-supplier relationships seem to be established rather quickly, with the median communication time being 2.9 days including a fairly long tail. Nevertheless, some love gurus would argue that length of time isn’t the key to building solid supplier-buyer relationships. Instead, they'd argue it's the quality of the engagement that really matters. One measure of this is the length of the message(s) - for instance, we found the median supplier-sent message was over 85% longer than the median buyer-sent message. One might also expect suppliers to be doing the majority of courting in this case. This comes as no surprise considering the many suitors (i.e. suppliers) Kinnek gives buyers to choose from. 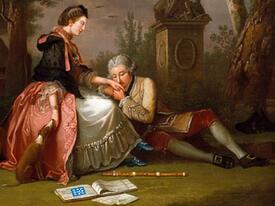 Another stronger measure is the result of the courtship. What does it look like when a buyer and supplier fall for one another? 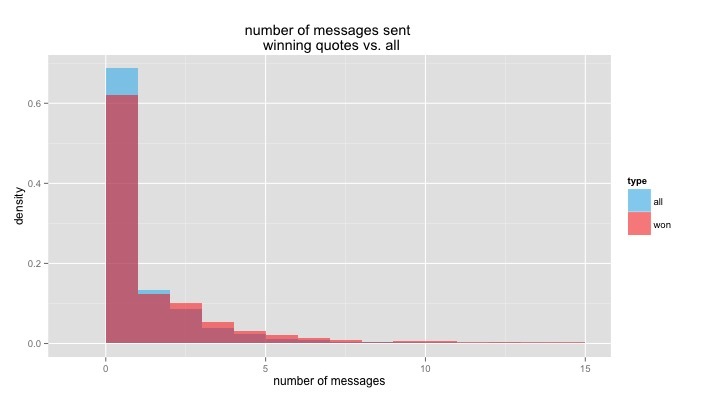 Well, for one, winning quotes tend to have more messages overall, with a mean numer of messages 50% greater than the baseline of all quotes. 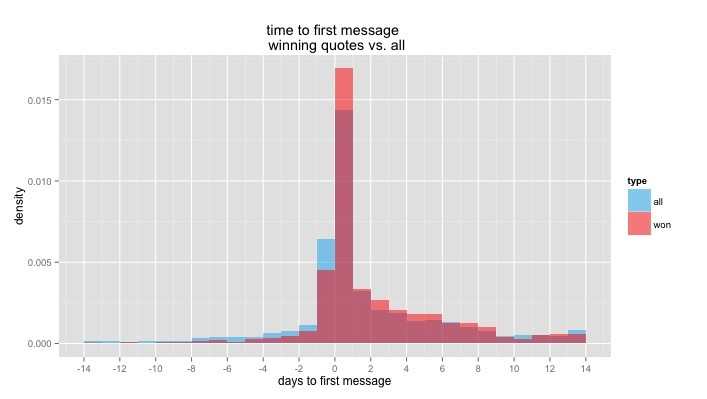 In terms of time to first message, winning quotes are distributed much more tightly than all quotes, with the winning quotes having two-thirds the time variance of quotes overall. 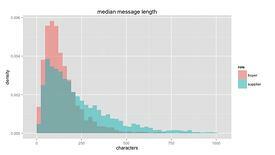 It’s also interesting to note the median message character length, which is almost identical between the winning quotes and quotes overall. 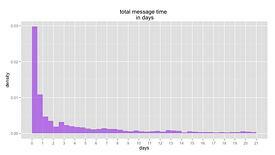 This implies that longer or shorter messages aren’t always indicative of a more successful interaction between the buyer and the supplier. Finally, we must also point-out these statistics don't necessarily give the full picture. For example, additional messages could simply be the buyer and supplier attempting to hammer-out the final details of an agreement, rather than still negotiating and/or deciding on the purchase. While this is all more descriptive than prescriptive, one thing's apparent here - more communication, the cornerstone of any relationship, can do nothing but good. We’ll continue to dig deeper into the more conditional aspects of these behaviors exhibited in buyer-supplier relationships. Subscribe to our blog to get the latest Kinnek news.